Stanley F. White, the fun loving, great spirited man has been sent to the angels above at the age of 81 years. He was born in Essex, VT, son of the late William White and Grace Larochelle White, on November 23, 1936. He was a man that lived life to the fullest. 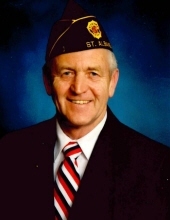 Stan served in the US Air Force for 4 years, married the love of his life, Wanda Chagnon, had 3 boys, retired from Agway after 32 years, was a past commander of the American Legion Post #1, and spent much of his time with a smile on his face surrounded by family. Stanley was predeceased by both of his parents and his wife Wanda, a brother Maurice and brothers-in-law Harold Ives and Russell Brock. He is survived by his sisters Sylvia Ives of Florida and Sandra Brock of Arizona, his sons Gary and his wife Debbie of St. Albans, Stephen and his wife Pamela of St. Albans, and Mark and his significant other, Donna Gabree of Fairfield, his grandchildren, Douglas of St. Albans, William (BJ) and his significant other Charlotte Hineman of Johnson, Jacqueline Hawkins and her husband John of Georgia, VT, and Matt and his significant other Rachel Beaulieu of Sheldon, his great-grandchildren, Kyrel and Briana Hawkins of Georgia, VT. Per the request of Stanley, there will be no services. Cheers to a wonderful man that will be forever missed, but always in our hearts. Memorials may be made in his memory to the American Legion Post #1, 100 Parah Drive, St. Albans, VT 05478. Arrangements are entrusted to the Brady & Levesque Funeral Home, where online condolences and memories may be shared with his family and friends at: www.bradyandlevesque.com. To plant a tree in memory of Stanley F. White, please visit our Tribute Store. "Email Address" would like to share the life celebration of Stanley F. White. Click on the "link" to go to share a favorite memory or leave a condolence message for the family.